All Russians who are immigrating to the United States have to attend an interview at the U.S. embassy in Moscow. This is true NO MATTER WHERE your loved one lives in Russia. Your grandmother may be in Magadan, but she still has to travel to Moscow. Your Russian bride or groom may have never traveled outside of their own oblast’, but the U.S. embassy requires this of every Russian that immigrates to the U.S. The trip can make even the most experienced traveler feel stressed and overwhelmed. For a first-time traveler, needless to say, it can be a scary nightmare. But we can shepherd your loved one through the process so that they feel confident going in to their immigration interview. More importantly, your loved one will feel more confident in their choice to join you in the United States. Also, have you considered joining your Russian bride or groom when they have their interview? If your resources allow it, your presence can be extremely comforting. 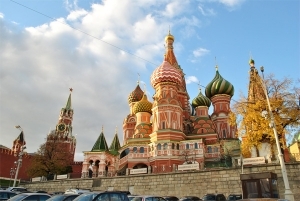 Maybe you could even make it an opportunity for a little vacation, visiting the important historical and cultural sights that Moscow offers. Let this trip be a positive opportunity rather than an experience akin to herding cats.